After returning from work early Friday afternoon I had a spot of lunch before loading up the car for the start of my trip out to the Isle of Harris. 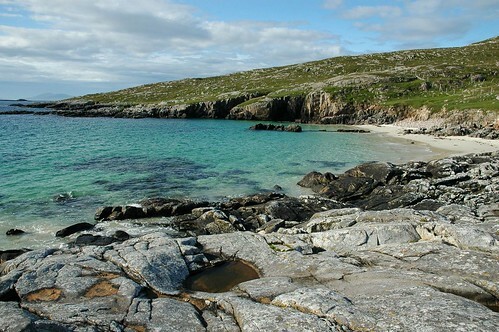 Situated off the west coast of Scotland Harris is one of a long chain of islands that form the Outer Hebrides, now more commonly referred to as the Western Isles. I had originally intended to cycle through all the main islands using trains to link up the journey from Aberdeen. However my decision to use a bike trailer to transport my luggage became my undoing as they are not allowed on the trains. 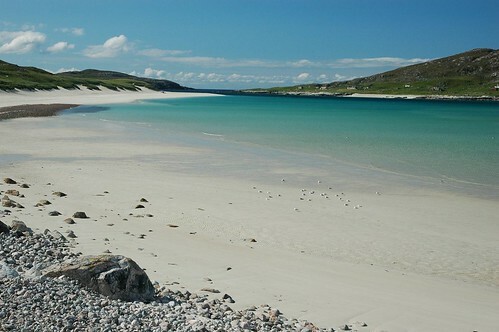 I decided to go and visit Harris and Lewis first and save the rest for another time. 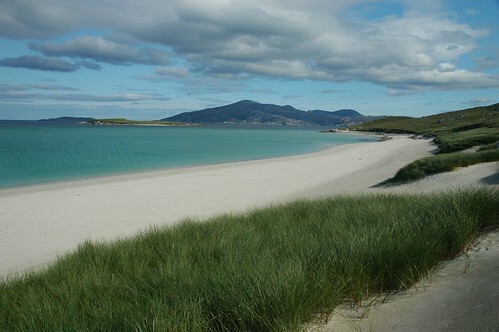 As it turned out my first visit to the Western isles would be confined mainly to Harris. Arriving in Ullapool early evening I soon discovered the place to very busy and only managed to find a B&B for the night with the kind help from the lady of a previous place I had stayed. I popped into town for some fish and chips and then went to the local pub for a couple of drinks, a band came on later in the evening playing some traditional but modernised Scottish tunes. During breakfast the following morning I chatted to the landlady and her husband. 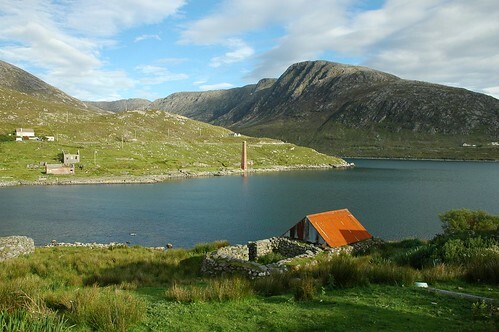 They have a croft over on Harris where he spends half of his time visiting and helping two of his sons who still live over there, he had just returned the previous evening. After parking in the large car park near the town centre and getting a few last provisions from the supermarket it was then time to offload my bike and trailer and head down to the ferry terminal. The ferry duly arrived and after the incoming passengers and cars had disembarked it was time for me and a couple on a motorcycle to head down the ramp first. 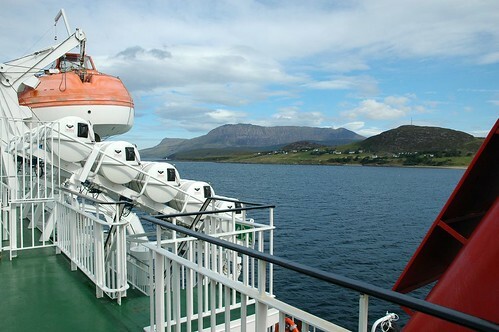 The cyclist had come over on the ferry from Norway via Scrabster in the far north east of Scotland. After a brief couple of days on Lewis and Harris they intended to complete their circuit by taking in the Isle of Skye before heading back up North. After boarding I grabbed a cup of tea and headed for the upper deck, it now felt like my holiday had finally begun. 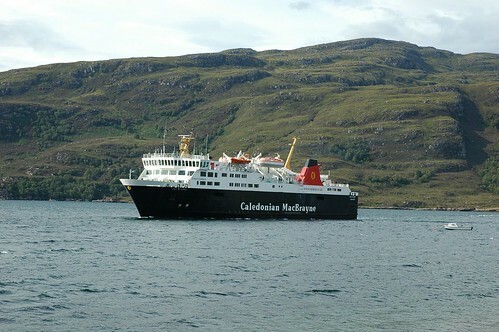 The ferry headed out between some of the many small islands that feature in the upper reaches of Loch Broom. 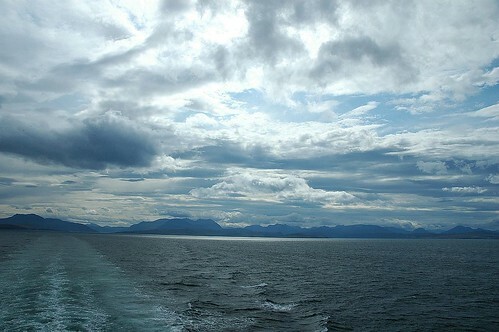 As we made the open sea many of Scotland's north western mountains came into view. 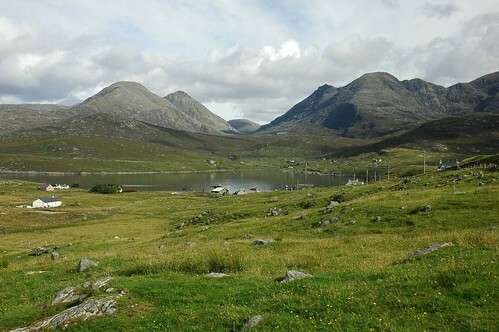 The mountains of Inver Polly to the north and the Torridon and Fisherfield mountains further south. 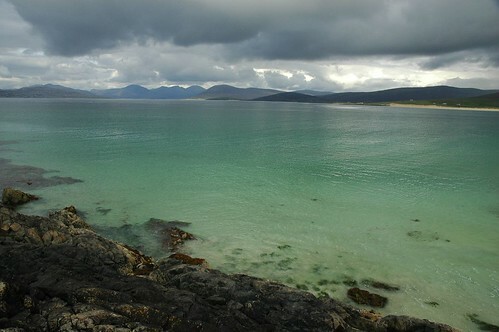 Out across the sea the Western Isles were already in view. I nipped down to the restaurant before we landed to have some lunch, enjoying some steak pie and beans. 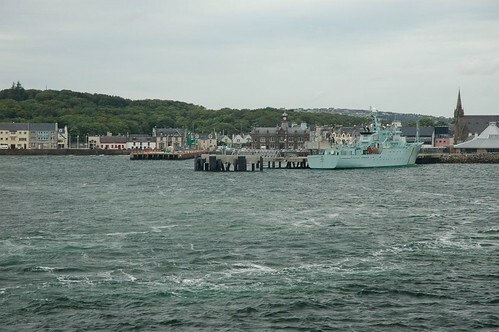 It was a little under three hours before the ferry duly arrived at Stornorway, the capital of Lewis and by far the biggest town in the Outer Hebrides. After walking ashore I pushed my bike while getting my bearings. The locals are renowned for the friendliness and it wasn't long before an old guy had me engaged in conversation, the sight of my trailer had caught his attention as he was making his way across to the local Saturday market where he had a stall. It must have been a full twenty minutes before I was on my way with instructions on how to find the main road south. I was soon leaving town and ascending what would be the first of very many hills. 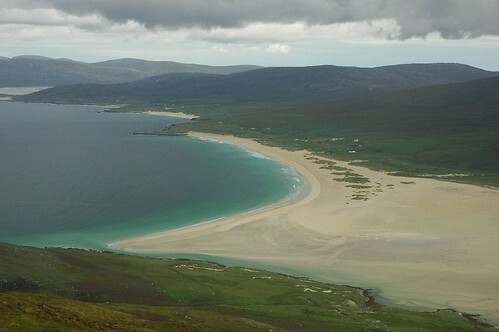 The fairly barren landscape led my eye out to the distant hills of Harris and my initial destination. I made steady progress along the undulating roads stopping for occasional breaks and to top up my water bottle. It was filled gladly at one point by an elderly lady doing a bit of gardening. I was again struck by how much the local dialect sounded more Irish than Scottish. 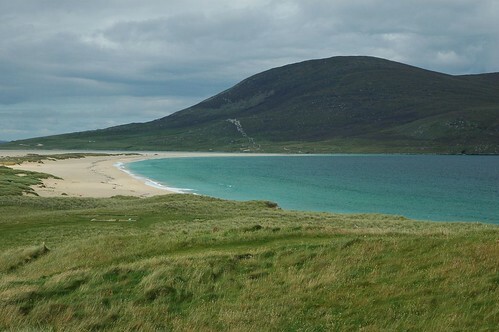 Shortly after one of the few level and straight sections of road I reached the shores of Loch Seaforth and the border that separates Harris and Lewis. 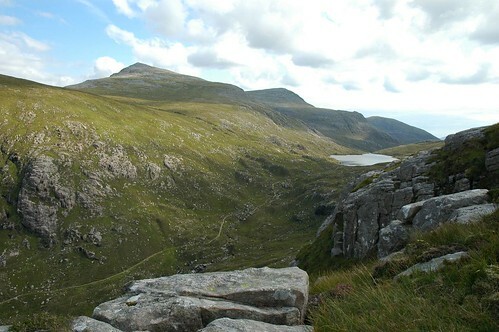 An imaginary line runs 10km east to west across moor land to the shores of Loch Resort. 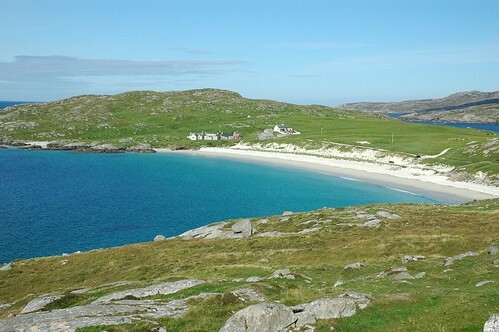 Harris and Lewis are quite often referred to as Islands but in fact form a single Island that is the largest of the Western Isles. 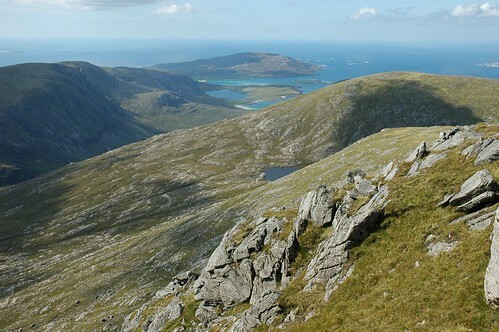 I now approached the foot of the north Harris Mountains and the biggest test of the day, negotiating the Clisham pass. The road at this point rises steadily from sea level to around 180m with one consolation that there would be a superb free wheel ride down the other side. I tried to put out of my mind the fact that I would need to do it all again in reverse later in the week! The top of Clisham, the highest peak in the western Isles at 799m felt almost within touching distance but would have to wait for another day, in fact as it turned out, another holiday. About 40km out from Stornorway I descended towards Tarbert but turned off onto a single track road that would snake its way along the shores of Loch Tarbert for nearly 25km to the small settlement of crofts and cottages at Huisinis. Just after the starting down the road I came across the old whaling Station at Bunabhainneadar, there is not much to see now but a tall red chimney stack still standing over 50 years after the station closed for the final time. Just around the corner I was surprised to come across a tennis court standing on its own just off the roadside, apparently available for hire. Roughly half way along the road takes an unusual route as it passes through open iron gates and into the well manicured gardens of Abhainnsuidhe Castle before exiting through a stone arch on the other side. Finally reaching Huisinis was a relief as the hilly road was beginning to take its toll, I was feeling just a bit weary. A stunning white beach greeted me as I rolled down the final slope of the day. 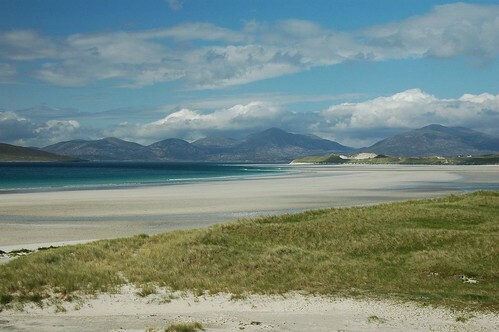 A couple of sandy tracks crossed an open area of Machair leading to a small quay on the opposite side of the peninsula. 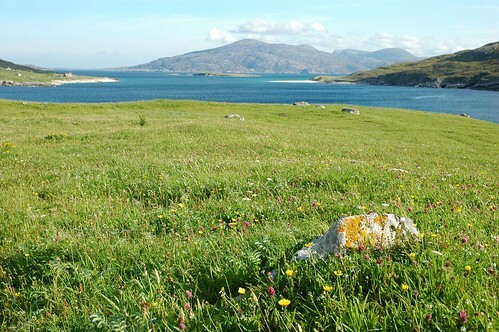 Areas of Machair are quite abundant on the western shores of the Outer Hebrides, usually found near sandy beaches these fertile grassy areas contain many colourful flowers and small plants. This particular area also provided a home for a great number of rabbits as well. There was only another couple of other tents and a couple of camper vans in residence so it proved to be a peaceful spot to for the next few days. 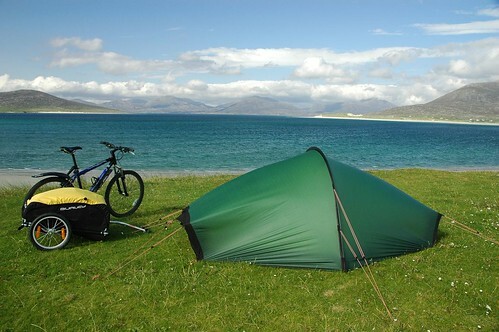 Usually when pitching a tent there is a tendency to find a sheltered spot but it made more sense to try and find a place that would be exposed to any wind blowing, this would hopefully keep the midges at bay. After putting the tent up I had a bit of a clean up before settling down for something to eat. 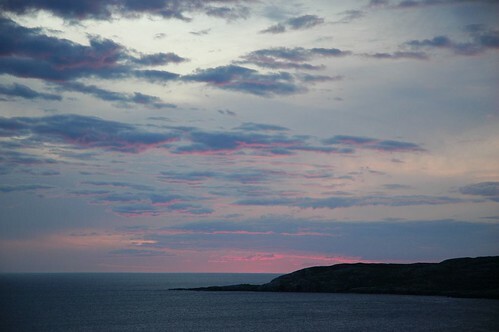 I then headed for the high point on Huisinis head to watch the sun go down, something I would enjoy on most evenings. The next day broke bright and breezy so after breakfast I packed my rucksack and headed off for a walk. Following a small track steeply up the hillside I made my way to the beach that runs along the sound of Scarp. A small point of white sand could be seen from my camp site but this turned out to be only part of a lovely long beach. The water running through the sound was an amazing turquoise colour and was looking very inviting. The Island of Scarp looked pretty empty despite numerous buildings near the shore. There are no residents nowadays although I believe some of the buildings are serviceable holiday lets. Lights on the island at night were the only give away to the fact that somebody was in residence. 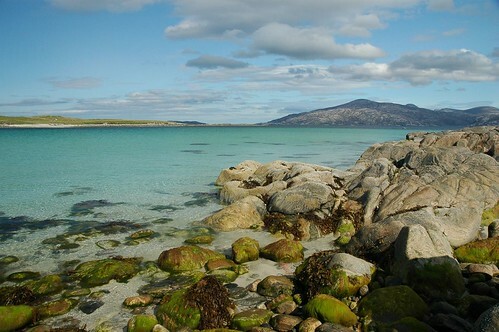 As I reached the end of the white sands and continued along the coastline became much more rugged. As I rounded the corner into another bay the whitewashed cottage of Crabhadail stood out below some cliffs next to loch Cleabhaig. A faint path ran down from the cottage to where a small boat was moored in a small bay that contained a couple of sandy beaches. It was now very warm so I decided it was time to test the waters. They were pretty cool but nowhere near as cold as I thought they might be. 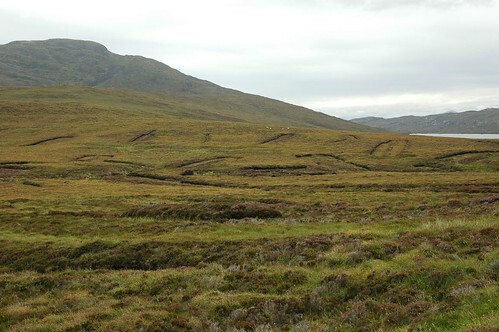 After drying off I headed inland up along the side of a burn that led me to the large Loch a' Ghlinne. As I stopped for a bite to eat a couple of walkers passed on the other side of the stream waving hello as they went by. The path along the loch side was interspersed with bits of bog and some rougher going but also provided some pleasant walking. 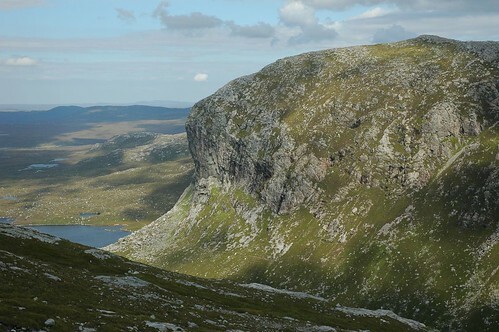 The two long sides of the loch are overlooked by hills while at its head a clearer path continued steeply up to a bealach. Spongy moor land proved to be not as wet as I first thought as I made my way across to the top of Leosaval so I arrived with relatively dry feet. A number of red deer watched my approach before scurrying away around the hillside. 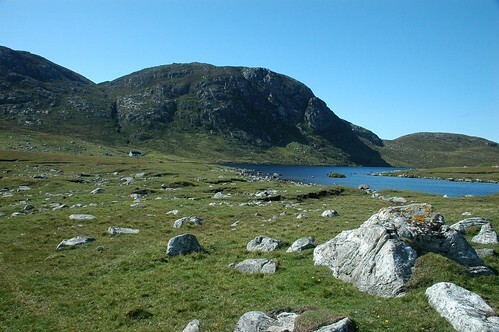 Using some of the rocky outcrops I then followed the broad ridge line before a steep grassy ascent led to the top of Huiseabhal Mor. Dropping down the heathery slopes and then following the burn on the east side of Huiseabhal Beg I emerged at the white cottage that I had seen earlier. A faint path then led back up onto the cliffs above the sound of Scarp allowing me to pick up my outward path. Next morning I decided to wander over the headland to take a look at the two smaller beaches just west of Huisinis. Another dip in the sea made sure that I was fully awake before returning to the tent. After a brew I grabbed my bag and cycled down the road to just east of the castle where a track leads up toward a small hydro-electric power station near Loch Leosaid. Leaving the bike here I headed further up the track before crossing some boggy moor to reach a more defined path that lead up Glen Leosaid to gain the top of the bealach where I had been the previous day. This time I had approached from the south rather than from the sea to the north. At the top I headed further inland over the rocks of Sgarbh Choinneach and then towards loch Braigh Bheagarais that sits between Ceartabhal and Tiogra Mor. The loch provided a nice lunch spot before continuing the climb up Tiogra Mor. As I climbed a large slender bird sailed above me silhouetted black against the blue sky. It reappeared later soaring across the hillside the white flashes on its wings giving it away as a Great Skua. As I gained height the ridge line narrowed nicely as it levelled off slightly. Something caught my eye ahead, just the shape I suppose, looking more closely through my binoculars revealed a large brown bird of prey perched on some rocks. It was looking about, occasionally in my direction, I crept forward a bit, then some more, but inevitably it took flight before I got much closer. It gracefully glided up in the air hovering above me momentarily before heading off at some speed across the Glen. I had seen enough though to be sure that it was a Golden eagle. Like many birds of prey they tend to eat their meals in set places and as I approached the spot where it had been perched it became evident from all the feathers and "white steaks" that this was its chosen place to lunch, very nice with considerable views. A short way on was the summit and a very mossy trig' point, it was time to have some lunch of my own. I made my way over to Tiogra Beg and then down the hillside to take a look at the spectacular rocky face of Sron Ulladal, one of the steepest Crag's in the UK. Traversing the hillside I then made for Loch Aiseabhat and the path that leads back down to the power station by the way of the larger Loch Chliostar. 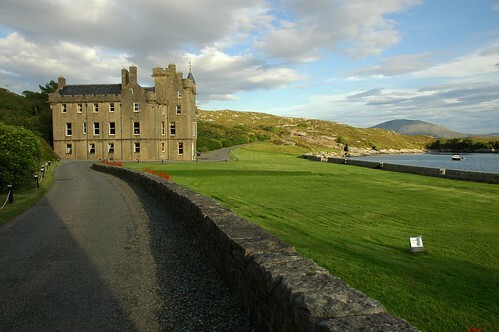 The last effort of the day was reserved for the cycle journey back along the road to Huisinis again starting with a passage through the castle grounds. A grey start the next day made me wonder if I would get packed and ready to move camp before the rain started. I was in fact a good way along toward the main road before the first few drops were felt but it never got too heavy and the weather actually brightened as I made Tarbert. I parked my bike near the information centre and did a little shopping before having what felt like a very luxurious shower. I then went to a small café for lunch before embarking on my journey into south Harris. 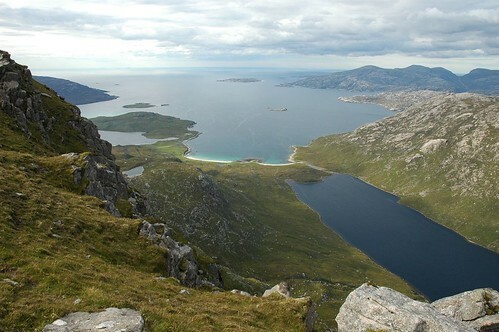 Another big climb from Tarbert was followed by some more ups and downs before the gradual decent towards Horgaboist. 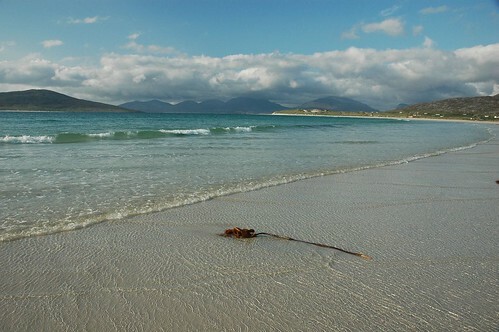 The island of Taransay, the home of some TV "castaways" for almost a year back in 2000, could be seen across the white sands of Traigh Sheileboist and water of the sound of Taransay. A number of camper vans and tents just off the road signalled my arrival at the campsite situated in the dunes above Horgabost beach. 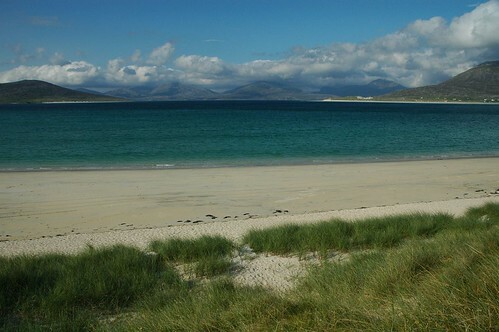 I pitched up overlooking the beach with the sea stretching out towards the Isle of Taransay just offshore and hills of North Harris in the distance. The campsite provided for some friendly Banta, Neal from Barra who worked on the CalMac ferries, a couple of girls up from Glasgow and Caroline formally from Lyon but now in London were just a few of those who would stop and chat over the next few days. It was now late afternoon but the sun was out so I nipped back up the road a short way to gain access to the sands of Traigh Sheileboist that stretch out across the estuary to Traigh Losgaintir. It was so nice and relaxing paddling along the shore enjoying the good weather. A handful of Gannets provided some excellent entertainment as they continually dived steeply into the surf just off the beach, tucking in their wings at the last second to form a spear of white feathers. They made short work of their catch before pulling themselves back into the air to start scanning for the next fish on their menu. Wednesday was a bit overcast so I decided that a little cycle tour was in order. Heading south I passed the golf course at Scarasta with its views over the sands below and the rounded hill Chaipaval across the bay. Further down I entered the town of Leverburgh before taking a turn toward the east side of the Island. I paused for a while watching a number of fishermen out on the lochs just outside of town. 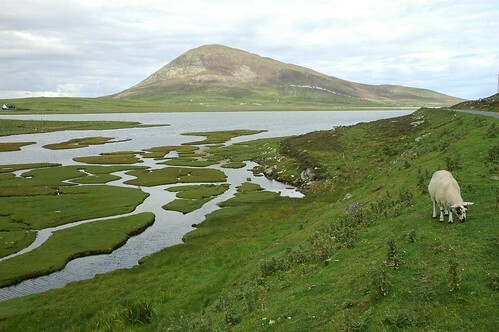 The countryside was fairly barren, peaty moor was interspersed with some more lochs before the hillside became more rocky as I continued toward the coast. A few birds including some more of the wild pigeons I had seen in many places provided the main glimpses of any wildlife. It was rumoured locally that this is where they filmed the "first moon landings"! Some curious shapes on the moor made me wonder if Alien visitors had got fed up with crop circles and started a new pastime in creating patterns in the peat. Maybe they were just collecting some fuel to warm their space ships. 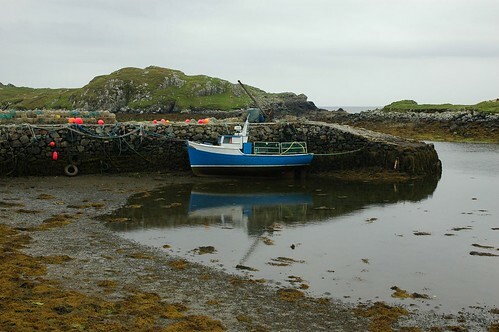 Arriving at Roghadal, the southern most tip of Harris, the road swings around the church of St Clements and past a small jetty before heading back north along the western side of Harris. Arriving at Leverburgh I stopped for a cup of tea, a few postcards and something to take back for my evening meal. A bit further up the road I stopped at the visitor centre at Seallam. 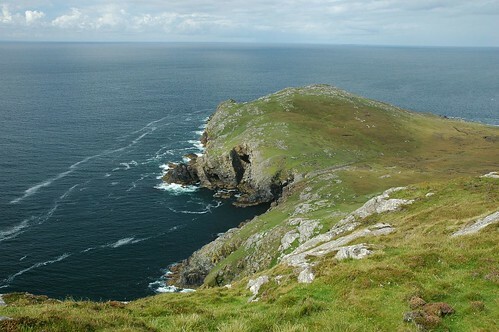 The exhibitions provided some interesting facts about the geology, flora and fauna of the western Isles and there was also a feature on the remote Islands of St Kilda. On my way again I came across a French student wandering along the road looking a bit lost, it turned out the he was searching for his rented bike. He had put it down in the grass while going for a wander out onto the beach. We soon found it a little further up the road and ended up cycling along together. 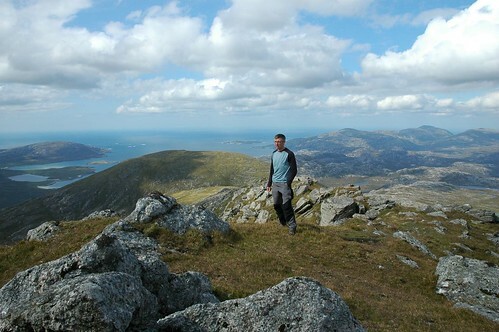 After reaching the campsite we had a bit more of a chat before he continued on his way back up to Tarbert. The first real rain of the holiday had been falling during the last half hour of the return to the campsite but eased soon after my arrival allowing me to get on a brew and prepare some food. A nice shower was in order before turning in after another good day. Thursday would be my last day before heading back up to Stornorway and the weather showed some improvement on the previous day, there was certainly a bit more in the way of sunshine. 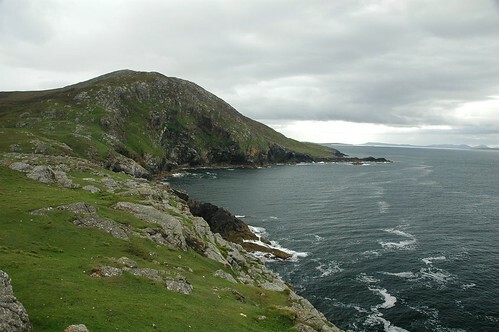 I cycled back down toward Leverburgh but turned of at the village of Taobh Tuath. 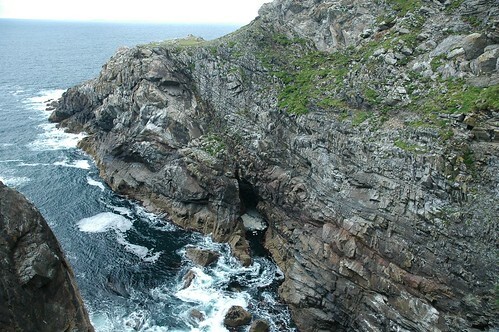 I was heading out to climb Chaipaval and to take a look at the sea arches at Toe head. 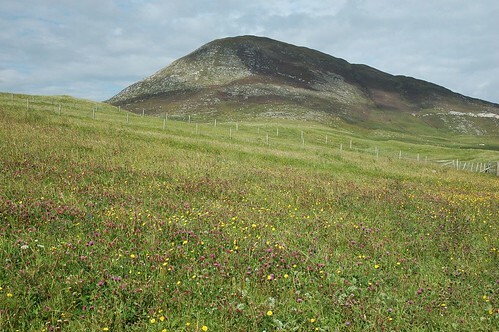 The walk started by crossing the lush Machair before a steady climb up the grass and heather bound hillside. 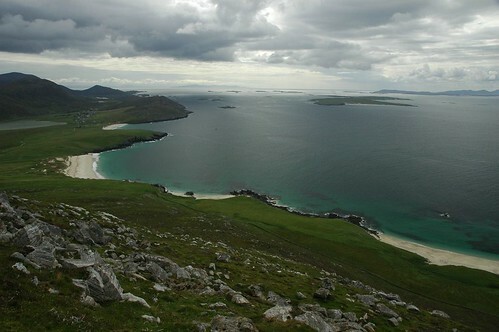 There were nice views down to beaches below and across the sea towards the Islands of the Uist's and Skye. 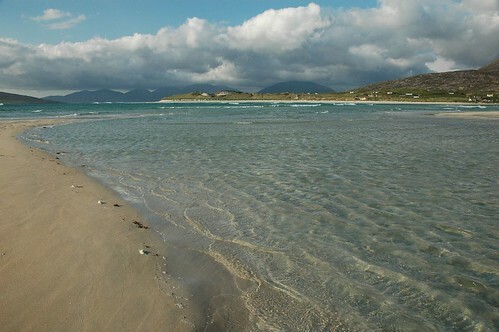 As I climbed higher the beach at Scarasta came into view on the other side of the peninsula. The hill seemed fairly rounded but after I dropped down the other side towards Toe head it showed a much rougher nature. Here were it is more exposed to the elements it had a steep craggy cliff face dropping into the sea. I watched as an eagle appeared from the rocks part way up the cliff and as I was looking through my binoculars and didn't notice another eagle until it appeared and almost locked claws with the one I'd been watching intently. One flew out over the hillside while the other returned to the cliff face, I'm still not sure whether these were Golden or Sea eagles. As I continued I was a bit confused as to why I was getting whiffs of the barn yard and not the salty smell of the sea. It was only then that I started to notice the numerous cow pats lying around. 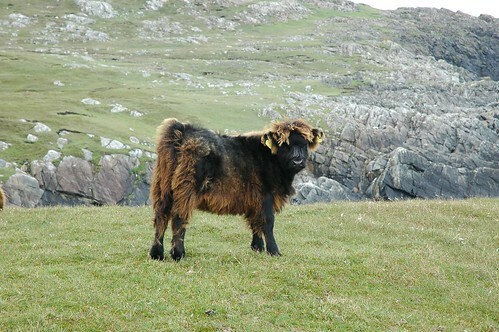 After looking at the sea arch off Toe head I continued around the coast and soon came face to face with those responsible for polluting the air, a number of highland cows. I wanted to get a bit closer for a few photos but seeing as there were young calves about I thought I should keep a reasonable distance and was encouraged to do so when looking at some rather long pointy horns. 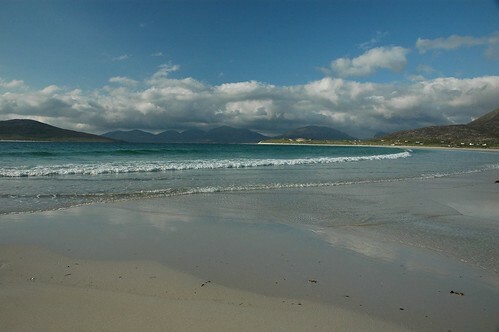 After a fair bit of rough walking I eventually made the main beach. It had been hot sticky going and I'd been bothered by midges in a number of places, at one point I had stopped to watch a large Grey seal gently swimming but had been forced to move after they had become to much of a pest. Another dip in the sea soon had me invigorated, a number of sea birds had their interests aroused by my presence in the water but just gave a cursory glance as they flew closely overhead. I stayed in the water a little longer than I had previously and probably because of this and the lack of sun at this point I started to get the shivers not long after getting out. I piled on my clothes and walked briskly up the beach, it still took a few minutes to warm up completely. After arriving back I spent evening chatting with Caroline, she had been out cycling for the day, intending to do something similar to what I had the previous day but she had ended up going a longer way around and instead of enjoying an easy day had found it all a bit tiring. Next day it was the long Journey back up through Harris and Lewis to Stornorway. I set off after breakfast around 9 but it took until late afternoon before I arrived at my destination. I stopped a few times on the way, taking in the scenary and a bit of a breather. A few kilometres after leaving Tarbert I could see the Old Whaling Station at Bunabhainneadar, this was just before my ascent up into the hills around Clisham. There were very few places to stop for refreshments along the way and I thought I was going to be disappointed when reaching the last one before Stornorway. The lady at the till in the shop said the cafe part had just closed, but she kindly went through and managed to get me a cup of tea anyway. It was very welcome and provided just enough of a boost to see me through the last few kilometres. I had a little wander around Stornorway town centre before heading out of town to what I hoped would be a good campsite near back. I was a bit disappointed to say the least so hi-tailed it back to stay at the one at the edge of town. This was very pleasant indeed with good facilities and a cheerful lady owner. After washing and eating I decided to walk back into town and go for a pint. I ended spending the evening talking to Joe from Glasgow. He had recently arrived on the Island at the start of a 9 month contract with the hydro electric company, a bit of a change from his last job out in Dubai. The evening was topped off nicely sitting at the picnic table at the campsite under the stars enjoying a curry I picked up at the Chinese takeaway, perfect! After the short ride into town on Saturday I had time to write a few postcards and grab a bacon sandwich at the tea room. A cloudy and windy day made for a choppy ride back on the ferry but it wasn't long before I was in Ullapool packing the car and heading back to Aberdeen at the end of a great holiday.